Oh friends, it has been a long while since I read the concluding events in Ruin and Rising! Honestly? I probably really would have benefited from doing a reread. Yet, I will be the first to admit that I was complete Darkling trash back in the day, and I have grown a lot as a person and realized that he is someone that shouldn’t be romanticized, but I was so damn hyped for this story and to see how the people of Ravka are doing after that final battle and living under a brand new king. And I can’t believe I’m saying this, but I was truly let down. Also, I want to emphasize that a three star rating isn’t a bad rating! I still enjoyed this and I loved seeing some of the character that I love with my whole heart and soul, and also falling in love with a new character, too! But this was just so ungodly slow for the first half, which is something I’ve never felt while reading anything by Leigh before. I know that we had a lot of be caught up on, but I just couldn’t immerse myself into the world or story until after the halfway point. 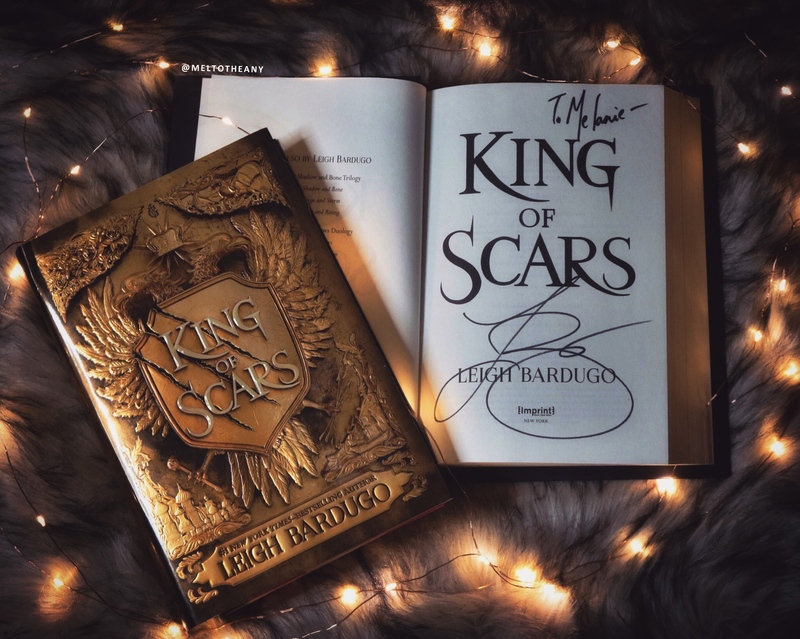 I really recommend that you don’t read King of Scars (or this review, honestly) if you have not read all the other books in the Grishaverse! But as a quick recap before I get into my thoughts and feelings: People are still fearful of Grisha and are capturing and killing them regularly. Grisha are also still becoming addicted to jurda parem, and many different variations of it, which enhances their powers but at a cost. And this story is told in many points of views, but there are pretty much only three locations that this story takes place, until they will (hopefully) all weave back together! Zoya and Nikolai are off with a new character trying to discover what lives inside Nikolai. Meanwhile, back at the palace, family friends are teaching a young boy how to impersonate Nikolai himself, so no one will know that he is away! And then we have Nina off on a completely new mission, where she finds out so much about herself and what is happening to Grishas in areas that are still living in fear of them. But this is a story about grief and loss and how living with those two things can impact your life beyond words. This is a story about being the person everyone wants you to be, while ultimately choosing the person you truly are. This is a story about feeling like your life is predicted for you, but realizing that you are capable of doing any and everything you want. ➽ Zoya Nazyalensky – One of the strongest Grishas ever (Squaller, of the Etherealki Order) and is an incredible fighter and leader. She was also the Darkling’s favorite, but is now my favorite. ➽ Genya Safin – My second favorite character! Genya, as the Darkling’s gift, used to be the servant to the Queen, and was treated so very terribly. She is much happier now, but still is living with the torture that the Darkling inflicted upon her. ➽ David Kostyk – A very skilled Fabrikator who helped make things to hold amplifiers. ➽ Tolya Yul-Bataar & Tamar Kir-Bataar – Twin Grishas who own my heart. ➽ Nina Zenik – Heartrender (of the Corporalki order) who used to be a part of the Dregs in Six of Crows! Now on a top secret mission, that is about to be jeopardized because of new information! Also, she is on a mission for herself to finally lay someone to rest at home. ➽ Hanne – Fjerdan who Nina meets and instantly feels connected with. Hanne is just trying to live in a world where every opportunity has been taken from her because she is a daughter and not a son. ➽ Leoni & Adrik – both are Grishas who are accompanying Nina on her new mission! ➽ Yuri – A monk who is with Nikolai and Zoya, who is also one of the leaders of Cult of the Starless, who worship the Darkling. ➽ Nikolai Lantsov – The current King of Ravka, who is expected to marry and produce an heir because so many foes are looking to overtake him. But he is dealing with the torture that the Darkling has left in his body. Nikolai’s monster is something that no one really knows how to control, but he is constantly being drawn to The Shadow Fold, which was the breeding ground of unspeakable shadow horrors and where the Darkling harnessed so very much of his immense power. We are also introduced to three new characters that I’m not going to really talk about because of spoilers, but they were amazing. I loved learning more about amplifiers, since there are so few people who have had them in this world and seeing the power that they bring is pretty intense and such a cool development in this story. Again, without saying too much, I loved all the scenes involving The Fold. But chapter twenty-five is the best chapter in this entire book, and that’s because Zoya is the best character in this book. Like, I get that it is called King of Scars, but this book was way more about Zoya and her beautiful story and everything that she has overcome than Nikolai’s. Especially since this book also spends half of the time focusing on Nina and what she is up to on her mission, I just feel like this is not Nikolai’s book; it was half Zoya’s and half Nina’s. Which is fine, I’m not saying I disliked that, I just feel like it was a weird flex because going in you expect it to be all things Nikolai and it really couldn’t be further from the truth. Plus, it really doesn’t feel like his character progressed all that much either, where Zoya and Nina both had tremendously big events happen that will alter their future and the very future of Ravka. Okay, but now I’m going to say the thing that’s probably going to make you all dislike this review, but I don’t really ship Nikolai and Zoya together. Like, I think the story would have been way more powerful if they were just friends. But this weird romance is laced throughout the story, even though there is no confirmation or reward or actual romance, it just felt weird to read. Especially with that annoying ending. I don’t know, I just really don’t ship them together, yet, but I probably will eventually. And I totally would have shipped them if we would have gotten more of them actually starting a romance instead of us just being like, “okay, yeah, this is totally the direction that Leigh is leading us!” Plus, that ending? I really don’t want another unnecessary love triangle. And I want this review to be spoiler free, so I’m not going to go into details, but you’re either going to love or hate the ending. And, friends, I for sure hated it. One of my favorite things in literature is when a spin-off series comes out, and the overarching threat is the ramifications of the what happened to that book’s conclusion and/or villain. 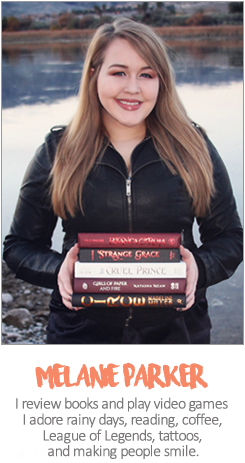 Having a cult that views the Darkling as a saint and worships him? That was the setup of my dreams, friends. And the ending just felt like such a cop-out and made me so angry and it really left such a disappointing taste in my mouth. Overall, I just didn’t love this the way that I truly anticipated that I would! Maybe I hyped it too much? Maybe I shouldn’t have reread The Wicked King right before starting this? Maybe I’m just being salty over the Darkling? I don’t know, friends, but this let me down. I am highly anticipating what will come with the next book, and I hope to have a much higher rating and happier review! Also, Ninth House is going to be everything and I still cannot wait for that 2019 release! Content and trigger warnings for drug addiction, loss of a loved one, grief depiction, captivity, slavery, implied past sexual assault (numerous times & numerous characters), torture, bullying, fatphobic comments (always in a negative light), mention of past death of a baby, attempted pedophilia, suicide, and war themes.